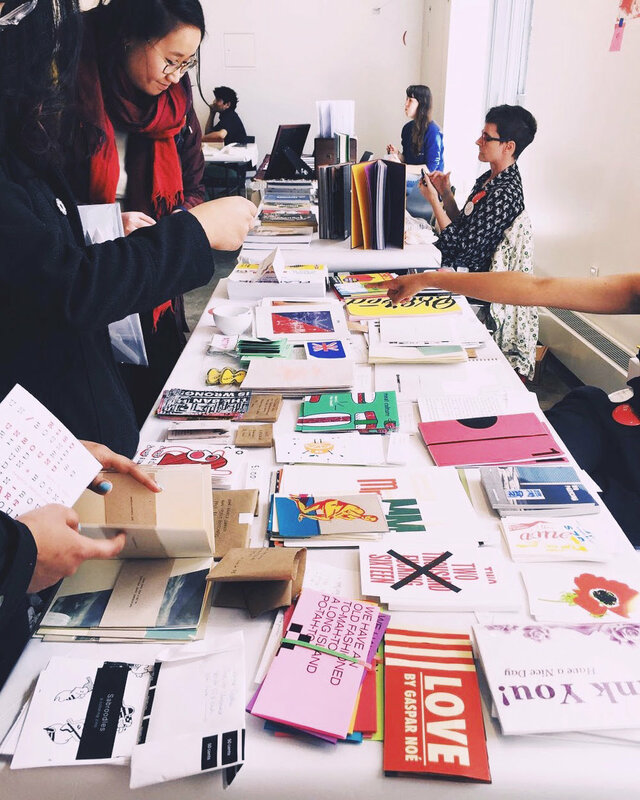 One of our favorite events is fast approaching: Unbound, RISD's annual art book fair. Mark your calendars for April 7, and if you're interested in exhibiting, jump on it: as of this AM, there are only 10 tables left! Register here. Artist statements are so often labored over for weeks, months, years even. 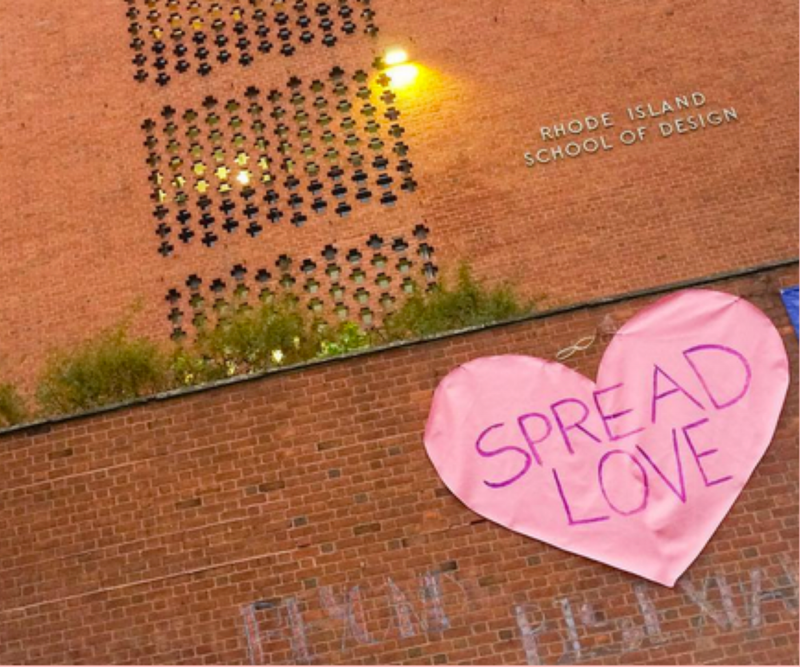 Last fall, we noticed a couple of very public examples of what we'd like to call "spontaneous statements." Exhibit A: Kara Walker's much noted statement (scroll down in this link) accompanying her fall New York show, which puts off all pretense of describing her work but expresses with the very power of her work the intertwined exhaustion and fury of standing against racism. Maybe she labored over this statement, but it feels like it came out in a single breathless burst. Exhibit B: Huang Yong Ping's statement in response to the Guggenheim's pulling the live animals in his Theater of the World from the work, leaving just its armature (see here). This one is scribbled on an Air France air sickness bag—it doesn't get much more urgent than that. Lately we've seen a few spontaneous statements around A&L, too. Here's one we love by Kathryn LaMontagne (Textiles), below. If you have an artist statement—spontaneous, refined, or anywhere in between—come on in; we'd love to hear about it. This workshop helps prepare for critiques by improving speaking skills. We will look at work and practice making comments and asking questions. Bring a project, piece, or idea that you are working on, or come to respond to others’ work. A collaborative group study session focused on improving accuracy in written English through group editing and discussion of common errors and grammatical structures. Students should bring an in-progress or finished writing project. An intensive practice session focused on American English pronunciation or “accent acquisition.” We’ll work on the sounds, melodies, and intonations common in American English, and you can request help with troublesome words or phrases. These workshops are designed to break down the written thesis book process into approachable pieces, open up new avenues for expression, and align thesis writing with studio work. The series is also an opportunity to get feedback from a diverse group of peers across departments in a relaxed, open environment. All graduate students are welcome. The first and last workshops are open. The middle three are a series requiring full attendance; maximum 10 students. Please RSVP to jliese@risd.edu. Weekly drop-in workshops for English language support are open to all. You do not need to register and can join in any week. Email with any questions: mkrinsky01@risd.edu. This workshop is designed to help you improve your speaking skills in critique. We share work, learn new vocabulary and common expressions, practice together, and improve by giving one another feedback. Bring a project, piece, or idea to share, or come to respond to others’ work. This workshop is a facilitated group study session for you to improve your grammar. We focus on useful structures and forms in context, and expand with writing and speaking activities. Each workshop has a grammatical concept as its theme. Additionally, students are encouraged to bring specific questions and topics they would like to address. All grads welcome. Come together to examine your work in innovative and invigorating ways, stretching the limits of expressive practice and busting out of common writing ruts. We’ll approach writing as a mutable medium, one that can be built up, torn apart, cobbled together, patch-worked, polished, exploded, and constructed like a work itself. The workshops are cumulative, but participants can drop in any week. Taken together, they provide material, methods, and inspiration for assembling the final written thesis and developing a rich language around visual work. We’ll also experiment with timed writing, writing to music, walking and writing, and writing using different modes and mediums. Your first H101 paper assignment—the formal analysis—is probably entirely new to you. Your H101 professor will guide you through its conventions, but you may want to learn more. In this workshop, we’ll review the essentials and the finer points of this cornerstone of art history and critical writing and share approaches to seeing, describing, and analyzing works of art and design. Feel free to bring assignment sheets, drafts, and specific questions, or just come and listen in. On September 27, musician, poet, and artist Patti Smith will be reading at the RISD Museum from her book Devotion (Why I Write). Tickets have been sold out for weeks, but hope is not lost! The drawing is this Friday, 9/22. You have four days left. We've gotten lots of (beautiful) entries, but your odds are still amazing. PS: This is Patti Smith, people! & Come visit. You can find us in the very same place: College Building 240. & See preceding posts for a selected view into our past. & Stay tuned for the future. Yesterday we stopped by the Fleet Library to witness one of our favorite annual rituals—the submission of graduate students’ written theses to the Library’s permanent collection. The moment felt especially festive as library staff (including Marc Calhoun and Ariel Bordeaux, pictured below) greeted students with chocolate fortune cookies and hearty congratulations. Poetry Workshop with CA Conrad — Join Us! In the past year or so, and especially since the election, we have noticed more students coming to the Writing Center with texts and speech expressing views about politics, social justice, and identity. Engaging with diverse and deeply held ideas and perspectives is a privilege we take seriously. Our ongoing research and approach to tutoring emphasizes respect for individual voices, experiences, goals, and learning styles. Last weekend we participated in a workshop led by Claudia Ford (Lecturer, HPSS), who helped us understand our role in fostering respectful, open dialogues, even, or especially, when they are difficult. We’re still honing our skills in this work — in fact, we agreed that this practice requires perpetual reflection — but we want you to know that we’re here for you. We invite you to come in if you would like support in processing and articulating your thoughts or feelings about complex topics, whether that means practicing a speech for a rally, writing a cultural critique for class, or preparing for a Facebook conversation with a friend. All opinions and beliefs are welcome, because we believe that silencing opposing views is unfair and unproductive when we should be discussing them. However, we will stand against bigotry, whether in words or in actions, and put our skills toward building a more inclusive community. We hope you will consider visiting us as a space for safe and open discussion. In a recent group meeting, the RISD Writing Center tutors answered the VARK questionnaire. VARK stands for the four different modes of learning: visual, aural, read/write, and kinesthetic. These styles affect not only how we learn but how we think, make, do, listen, speak, read, and write. Some of us were surprised by the results—one person discovered that she is primarily kinesthetic, for example, when she thought she was firmly in the read and write camp. These surprises challenged our assumptions about others’ learning styles as well. We used our new awareness to think about tutoring methods that might best serve various learning styles, and about how these preferences come into play in the studio. Here’s the questionnaire if you’re interested in taking it yourself. And next time you come to the Writing Center, feel free to share your style! On October 16, 2015, from 1-5, the RISD Writing Center’s dream symposium will be happening right here at RISD. If you’re interested in writing as an artist or designer or writing by artists and designers, you won’t want to miss it. Click on the poster below for all the details. Pomp and circumstance with hi-jinx, hilarity, and a touch of anarchy — RISD Commencement is always a headline-worthy affair. But this year was extra exciting for us, because Malcolm Rio, Graduate Student Speaker, and Rachel Ossip, Senior Class Speaker, both happen to be RISD Writing Center tutors. Malcolm stood tall in his studded heels, checked his snapchat, and argued for the value of learning to “fail well” in a world of contingent crises. Rachel compared the RISD we know today to the drinking fountain we could have been in a poetic meditation on origins, water, and what stays with us. Of course John Waters was insanely amazing, but these guys were just as brilliant, just out of the gates of RISD. Check out their speeches at right, and visit the RISD Commencement 2015 website for more. 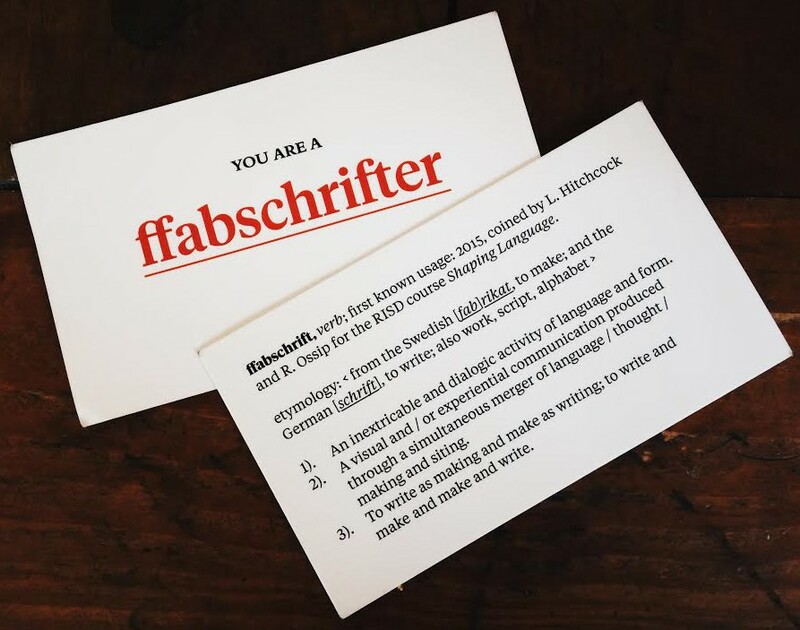 Students of Lucinda Hitchcock and Rachel Ossip’s Shaping Language course spent the semester “ffabschrifting” — treating writing as making and making as writing and simultaneously creating content and form, each with the other in mind. The class hosted a final event/party downtown in the Design Office last night. Each student read their own poem/story/definition of “ffabschrifting,” and Hitchcock and Ossip read a transcript — no, a ffabschrift — of their own previous conversation about the course’s development and all the brilliant, unexpected ways students took on the role of ffabschrifter. This variety sparked some engaging debate: on the one hand, it seems like we are all ffabschrifters, whether we know it or acknowledge it or embrace it or not; at the same time, purposeful and conscious attention made all the difference to everyone’s process and resulting work. The group then invited visitors into the discussion with some questions: Does ffabschrifting have to involve text? Is it limited to just writing and making? Is “ffabschrifting” the right word for what’s happening here? Amid all these loose ends, one thing was certain: ffabschrifting is more than a practice — it’s a movement. We love these ideas and these questions, and can’t wait to see how the movement advances. The Shaping Language course will be offered to GD seniors and grad students again next year (and non-majors with permission from the instructor). Check out the details and apply by Monday, April 6. 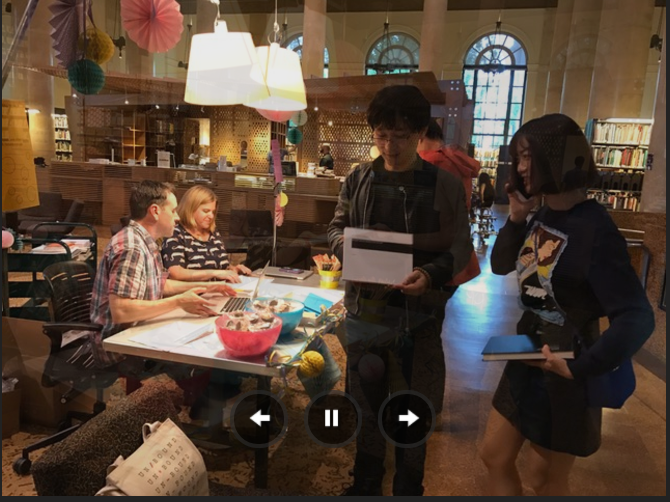 The Writing Center is very proud to be co-hosting “It, Me, You, Us: Close Encounters with Interpretation,” a series of lectures exploring varied ways of writing about and engaging with art, with an emphasis on the sensory, the subjective, and the shared. Why? Because experiencing art, thinking about art, and talking about art are all essential aspects of writing about art. Don’t miss Mira Schor, one of our very favorite artist-writers, on October 16. And in the meantime, visit her blog, A Year of Positive Thinking. Mira Schor, Portrait of My Brain, 2007. Oil on linen, 16 x 12 in. To view all of our blog posts, click here!